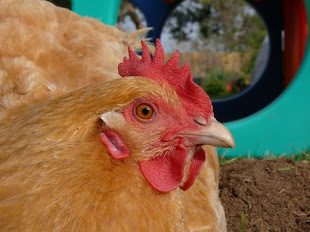 Chicken Blog: Are You Surpressed? You know, when something impresses you and surprises you? Surpressed! That's more or less how Maria explained it to us. She thought her classmates would be "surpressed" with the red ribbon she was wearing, headband style, to school. And I thought I would surpress you with the news that our garden beds are finished! Even though I got myself fired during the design, measure and cut phase of the whole project, I was allowed back on the job when it was time to fill the beds and plant them. It's an honor and a pleasure. Also, please note our apples. There are eleven medium sized apples growing on our new tree. Each piece of fruit accounted for and eagerly anticipated. At the last family farm meeting we were unanimous in our decision to bake one awesome chipotle-apple pie. 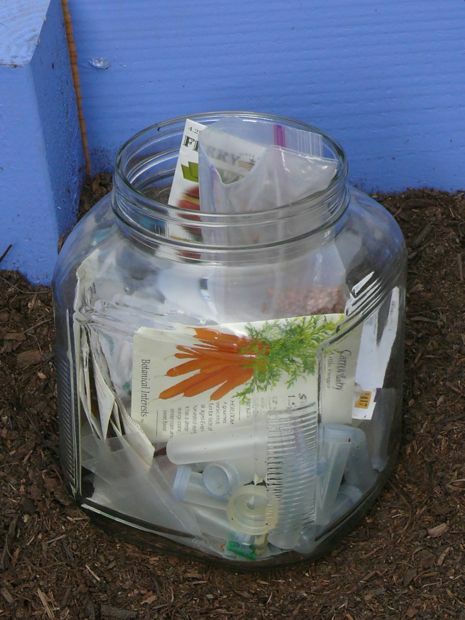 And finally, after seven years of container gardening, we are breaking out the big seed jar of delayed gardening dreams! I also picked up fresh seeds, just in case. Our four, very deep beds, are beautiful. They are full of good, organic planting soil, and they each have their own riser for drip irrigation. And they are painted a lovely, energetic shade of blue. And if they weren't four feet wide, I would hug them. Instead I pat them affectionately. Max has always wanted his very own garden bed. 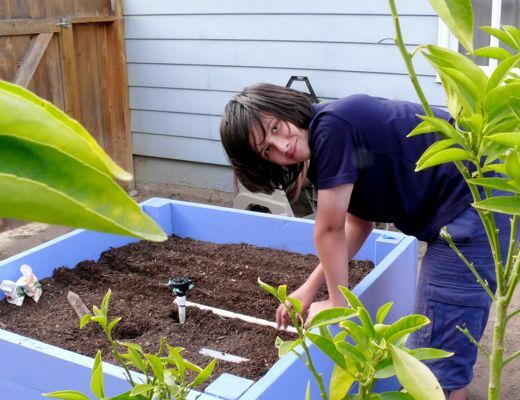 He read the seed packets, and like a true engineer, he followed the directions to the letter, measuring the rows and depths. He planted corn, beans, and sunflowers. He knows the names of the two kinds of heirloom corn he planted, and he was totally surpressed to discover that corn seeds look just like corn, that sunflower seeds look just like sunflowers. This is why. This is why we need to play in the dirt, put seeds in the ground, construct, destruct, investigate, think, make, tinker. "Obvious" is a relative term, and without real experience we might be missing wonderful, surpressive things, that some think are "obvious." I love that he was impressed and surprised. I love that he has his own garden bed. Alex and Maria helped fill the other beds. Alex procured tools, read our gardening book, and helped with planting decisions. Maria dug holes, dropped seeds, danced, sang songs, and clasped her hands gleefully. 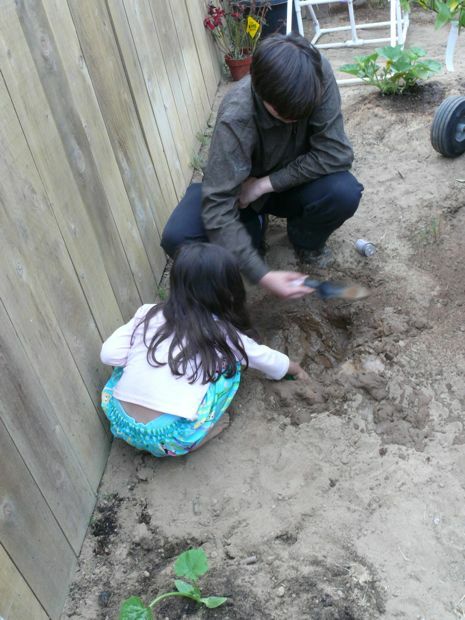 Alex and Maria also excavated the mystery rock from the hole where I was planting our second zucchini. Is it really necessary to plant a second zucchini? Has anyone ever run out of zucchini? The children do not want be short of zucchini, not as long as they can recall the deliciousness of their Great-Grandma Nancy's zucchini bread. Right. So we are planting three! zucchini! "Carrots Love Tomatoes," my favorite gardening book. 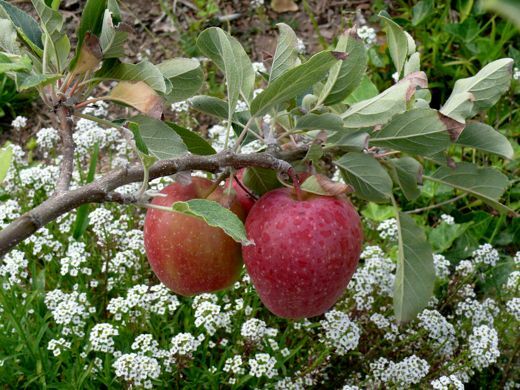 It pairs veggies, fruits, and herbs for companion gardening. Some plants protect each other from pests, some plants do not get along and will hinder each other. I've got the book to help me keep it all straight. We put the eggplant, basil, and peppers in the same bed. And of course Max planted the maiz and frijoles together. We sprinkled lots and lots of carrot seeds among the tomatoes. We planted radishes and beets. I do not like radishes. And beets taste like dirt. They really do, but I love to juice beets, apples, carrots, lime and ginger... it makes the best, sweet, spicy, refreshing dirt juice ever. How does your garden grow? What might surpress us? 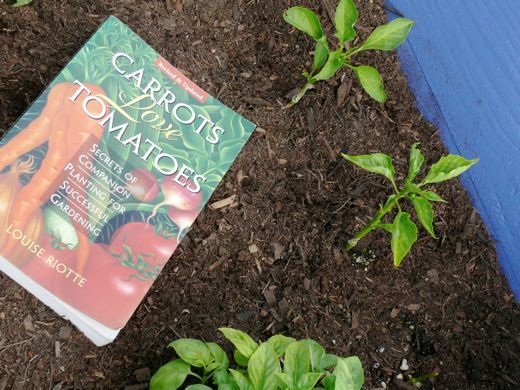 Carrots Love Tomatoes is one of my "go to" resources as well. As for radishes - don't eat 'em if you don't like 'em. Just keep planting them to keep the nasty pests away. Please visit my blog to see something very surpressing posted June 7 & 8, 2010. Love the energetic blue beds! My daughters and I planted a container garden on our porch. Herbs, onions, lavender and some flowers. We're loving the progress and I take such pleasure in watching them tend their little plants. We're about to rig up some kind of trellis so the morning glory can climb! You said apples and I had to pause to go get some, I was hungry! 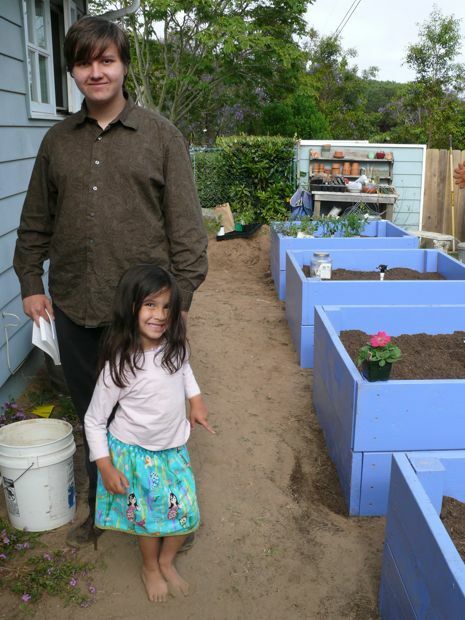 Your garden looks amazing, can't wait to see how well it turns out! I always plant 6 zuchini. Plenty to eat when they grow and plenty to shred and freeze for winter. Your garden is impressive! We used to have a giant one when I was little and we used to complain about having to work in it all the time. I wish we had it to complain about now....I hope everything grows really well and that all of you have fun working in it! Dirt Juice! Ha! Ha! When I was 4 years old I a dirt. Hmmm! Love that almost periwinkle blue! I am sure some people (yet to be named) wished I was surpressed!! What supresses me is your family - what lovely kids, and how wonderful to see you all planning and working and playing together. If your garden grows as beautifully as your family, you'll be well fed. Love your garden! Wish I had enough sun to grow even a small one. Hands down... the most beautiful planting beds I've ever seen! I wish you lived next door. Why do we have to be at opposite ends of I-5?? xoxox! PS, my word verify was "refulsi". It sounds like something wonderful you'd make out of pasta from some wheat you grew in your compost.